With “Red Hook Summer,” it is clear that Spike Lee is back. Back in Brooklyn, back in the sweltering summer heat, back with stories about black America that no one else is telling. “Red Hook Summer” is not a perfect film, not by any means. But it does what we used to expect a Spike Lee movie to do and what he has not done in many years – share with style and complexity the experiences of a certain segment of the black urban community. Lee was first black director to achieve mainstream critical and commercial success. There were other black directors who had successful careers – Melvin Van Peebles jumps to mind – but none who achieved approval from the establishment. Now that is not exactly a badge of honor, and it doesn’t mean that Lee was in any way a better filmmaker than Van Peebles, but it means that Lee was an “important” director who earned a place in cinematic history, and he lived up to that classification. He has made several great films about the black American experience, including “Do the Right Thing” and “Malcolm X.” There were more than a few years there when a new Spike Lee movie was a cause for celebration and excitement. But now we have cause to celebrate again. “Red Hook Summer” is the most lively, vital film Lee has made in a long time. 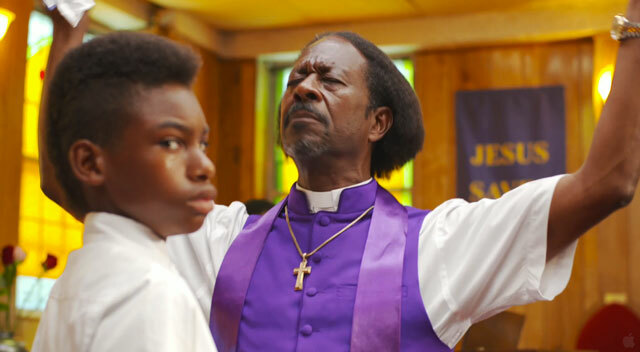 It is a portrait of a place – Red Hook, Brooklyn, where Flik Royale (Jules Brown), a twelve-year old private school boy from Atlanta is spending the summer with his estranged grandfather, Enoch Rouse (Clarke Peters), a Baptist bishop in the run-down neighborhood church. Flik is disappointed to learn that he will spend his summer working for free at the church, even though he meets a girl there, Chazz (Toni Laisath), who shows him how to enjoy Red Hook. When he is around his grandfather, however, he spends his days sulking, despite Enoch’s best efforts to impart wisdom and teach him about faith, a virtue that he has not learned from his widowed mother. There are two competing plots in “Red Hook Summer” – Flik’s summer of maturation and Enoch’s efforts to save the church, which is deep in debt – but only the latter really comes into focus. As for Flik, he learns a few none-too-profound lessons, such as the value of compromise and learning that people are not always what they seem, but these lessons are never really earned. Flik is not a well-rounded character, just an inartful audience surrogate for us to observe and learn about Red Hook. Through his eyes, we see all that Red Hook has to offer, its sense of community and its danger, its beauty and its flaws. Despite the film’s failure to connect us to Flik’s journey, the characters that Lee sketches for us are so vivid and his visual style is so assured that “Red Hook Summer” is never uninteresting. As usual, Lee has real issues on his mind, too. In Red Hook, he shows a black America that has not changed much since Obama took office, despite promises to the contrary. Poverty is rampant in the inner city, and gentrification continues to cause strife, both economic and cultural. And people, ahem, cling to religion, although the film’s central tenet is that those selling faith as a perfect solution in an imperfect world have another thing coming. All in all, it is a welcome if somewhat rusty return for Lee, who uses a lot of his old tricks but with a new twist. His signature visual flourish, for example, is having characters monologue directly to the camera, breaking the fourth wall. In “Red Hook Summer,” he gives this technique a diegetic basis, as Flik is constantly filming the characters of Red Hook on his iPad. We get the feeling, in fact, that Lee sees a lot of himself in Flik. As a chronicler of the urban black experience, Lee must be both inside and outside of it at once, and Flik, the private-school adolescent who filters the world through his iPad, reflects this dichotomy. Lastly, Lee has not lost his touch with actors. He directs Clarke Peters to a virtuoso performance that ensures even when the film is not firing on all cylinders, our attention is repeatedly drawn to the charismatic, complex, tortured man at its center. Although the film is ostensibly about the people of Red Hook, Peters’ performance steals our attention away from everyone else. He plays Enoch as an anachronism, not just an old-timey preacher in a world full of iPads and vegan grandchildren, but as a man selling pure virtue in a world that does not believe such a thing exists anymore.